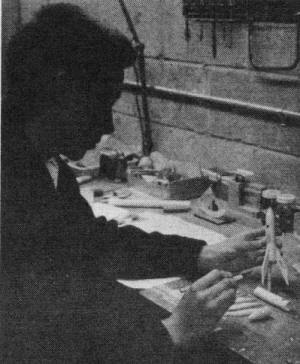 Harry (aka "Old Rocketeer") Stein wrote a monthly column for American Modeler back in the 1960s that covered a variety of topics ranging including model rocket contesting, model rocket building and trimming for flight, recovery systems, and even a little rocket scientist theory when appropriate. This particular article discusses getting started in model rocketry with using the diminutive Astron (Estes) Scout rocket which used a low-tech tumble recovery system. With the Space Age in full swing by that time, youths and adults around the world were anxious to get involved. It was an exciting time for everyone. 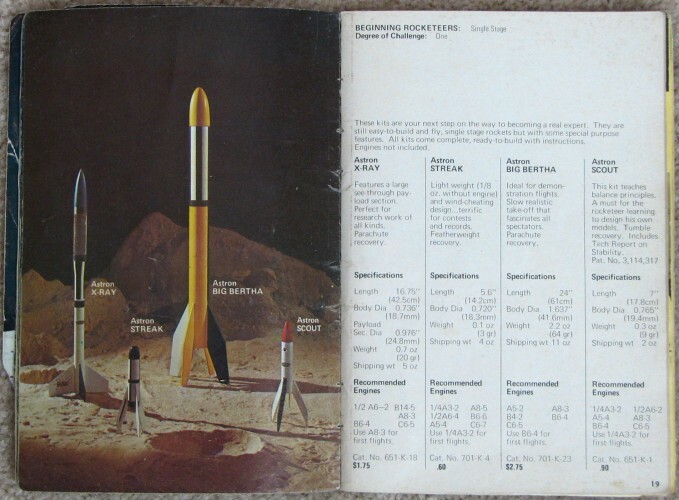 My own foray into model rocketry began in the late 1960s during the Apollo program's moon missions. 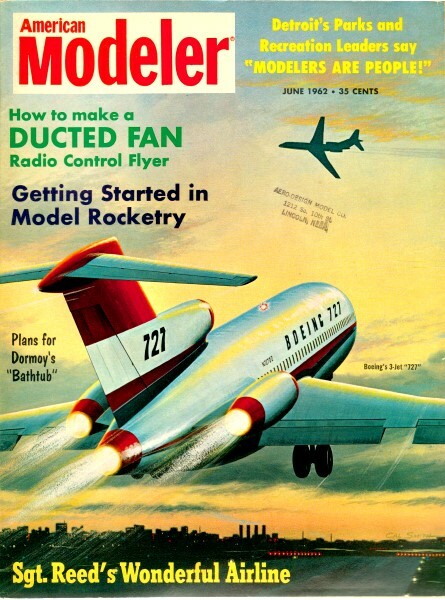 By then, American Modeler had become American Aircraft Modeler and Mr. Stein no longer wrote his column, so I never read one until a few years ago when I began collecting vintage aircraft modeling magazines for posting here on Airplanes and Rockets. Show me a fellow with soul so dead who never to himself hath said, "I'd like to fly a rocket." This is a symptom of a contagious disease prevalent in many civilized nations of the world. It can be fatal if the afflicted person starts off by trying to mix his own rocket propellants. However, if the patient chooses to buy his rocket engines from a reputable manufacturer, it means that he has contracted a non-lethal form of the rocket disease and can be well on his way to having the time of his life. The non-lethal form, called "model rocketry," is lots of fun. The critical stage of the disease occurs within the first few weeks. It involves confusion on the part of the patient in the form of, "Where do I get stuff? How do I get started?" Chances are that you will not find any model rocket equipment in your local hobby store. The customer demand for model rocket stuff isn't that great - yet, few dealers stock kits, engines, and equipment. But while you're there in the hobby store, pick up some dope, glue, an X-acto knife, and some sandpaper ... you'll need it later. So the majority of model rocket equipment is sold by the manufacturers. If you want to get into model rocketry, you'll have to do it by mail. At last count there were seven model rocket kits and nearly 24 different types of model rocket engines available. I am going to suggest specific products here to get you started right. Besides tools and about five dollars, you are going to need (A) model rocket, (B) model rocket engines, and (C) launching equipment. There happens to be a combination of these three for five dollars that will start you into model rocketry. All are sold by Estes Industries, Inc., Box 227, Penrose, Colorado. For two bucks, you can get the Estes "Astron Scout" kit and three engines. The Astron Scout is a fine little bird with splendid performance. In fact, you won't believe it until you've seen it. Fairly simple to put together, it takes about four hours. The kit doesn't look like much when you get it in the mail, but it contains good quality materials, is well-engineered, flies reliably, and will go out of sight. It comes with proper instructions and a technical report on rocket stability. For his Astron Scout Vern Estes makes a very good model rocket engine. In fact, he turns out more engines than any other manufacturer. Estes engines all have the NAR Safety Certificate, which means that they've been checked carefully by the testing committee of the NAR and have proven themselves to be reliable and safe if handled according to instructions. Uncle Sam allows these engines to be shipped through the mail, which should tell you that they won't blow up. For two dollars, you've got a model rocket and three engines. This allows you to fly the Astron Scout three times. If you buy more engines from Vern, you can keep on flying the Scout indefinitely just like a model airplane. Estes' NAR Type 1/2 A8-4 powerplant will put your Astron Scout about 400 feet up. Using Type A8-4, the model will do about 800 feet. With the super Type B8-6 engine, an Astron Scout has never been tracked ... but the NAR boys know it will do better than 1,000 feet. Because of the Astron Scout's unique recovery system, you can fly it nearly anywhere. It kicks its engine back and becomes unstable when it gets to peak altitude. It comes back from the blue end-over-end like a falling leaf. With no parachute to hang up in trees, it goes right on through trees to the ground, where you pick it up and get it ready to fly again. To fly the Astron Scout - or any other model rocket you may make in the future - you must have a launching system. Unless you belong to an organized NAR group that already uses these things, you're going to have to construct them to fly your birds. Estes makes a dilly of a launching system, the "Electro-Launch," that sells for $3. It combines a rod launcher with a firing system run off flashlight batteries. It, too, comes in kit form with excellent instructions for assembly. It goes together quickly, and you will learn a great deal about launching systems from it. You'll need four Size D flashlight batteries, costing you about a buck, to run the Electro-Launch. The batteries will be good for about 100 launchings. The Electro-Launch is cheap to operate, and breaks down into handy pieces small enough to carry around in your tool kit. I have two of them (although I belong to an NAR Section with complete range gear) because sometimes I like to go out and fly by myself. Finally, you will count-down, press the ring switch, and marvel. That collection of paper and balsa on the launcher will come to life ... and there she goes! Straight up! Look at it go! Joe, did you see where it went? There it is, tumbling back to the field. After several flights, you will discover that you have passed the crisis of the model rocket disease. You have built and flown your first model rocket. The disease will either abate or get worse. You've got all the basic equipment to go ahead in the hobby, and the farther you go the more fun you will have and the more you will learn. You'll end up with the catalogs from Estes, Model Missiles, Coaster, and all the rest. You'll be buying body tubes, engines, nose cones, balsa, dope, and glue, trying new ideas and generally having a ball. You'll learn that you can build your own models for less than 50 cents each, when you get good at it. You are now "started," and if you have reached this point and want more, you are hooked. The next thing for you to do is to join the National Association of Rocketry like every other feverish model rocketeer. Just drop a post card with your name and address to this magazine. Ye Kindly Old Editor will see to it that I get it, and you'll get all the poop from the group right away. If you do turn out to be a model rocketeer, you'll be into rocketry quicker, faster, and safer than any other way. It's a whole new form of modeling ... and you'll know what I mean when I say it's a disease that all of us rocky-tears suffer from.